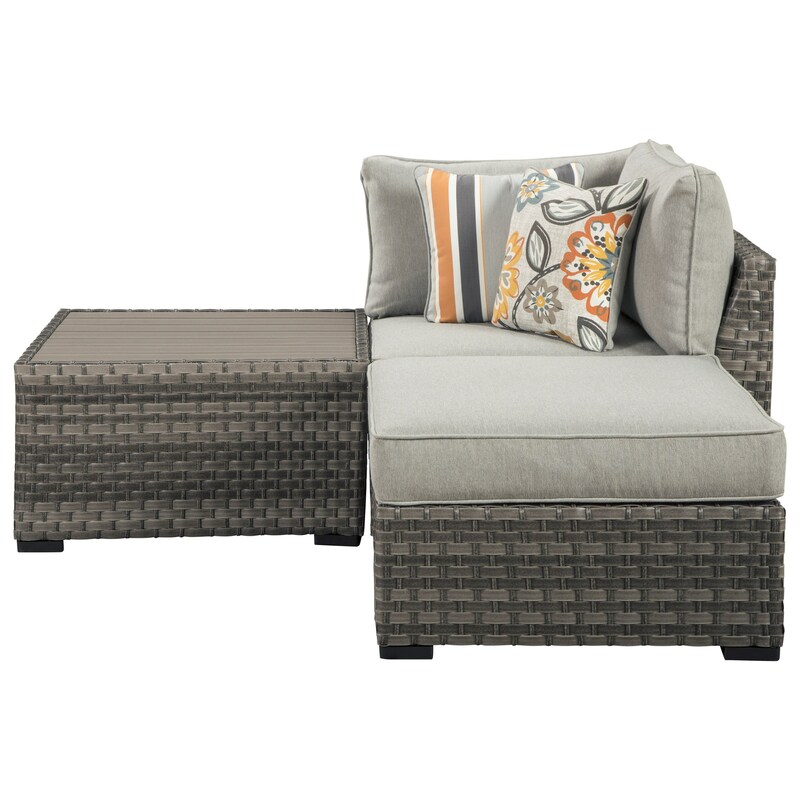 This three piece outdoor set offers all the style and durability for your outdoor space. A corner chair, ottoman, and cocktail table are included in this set. The Spring Dew Cocktail Table & Ottoman & Corner Chair Set by Signature Design by Ashley at Miskelly Furniture in the Jackson, Pearl, Madison, Ridgeland, Flowood Mississippi area. Product availability may vary. Contact us for the most current availability on this product. Construction Welded rust free aluminum frames with resin wicker covering. Fabric Options High performing Nuvella™ fabric is made to stand up to the elements. Bring your luxurious lifestyle outdoors with this stunning collection. Arrange the sectional pieces to best fit your outdoor space - big or small - and lounge comfortably knowing that this furniture is made to withstand all types of weather. With clean lines and an appealing resin wicker design featured throughout all the pieces, this collection is both functional and stylish. The Spring Dew collection is a great option if you are looking for Contemporary Outdoor Furniture in the Jackson, Pearl, Madison, Ridgeland, Flowood Mississippi area. Browse other items in the Spring Dew collection from Miskelly Furniture in the Jackson, Pearl, Madison, Ridgeland, Flowood Mississippi area.